National Curry Week is fast approaching! With the autumn nights drawing in, how about tickling your customers’ tastebuds with a warming curry? And here’s another good reason to have curry on the menu – it’s National Curry Week from 22-28 October. 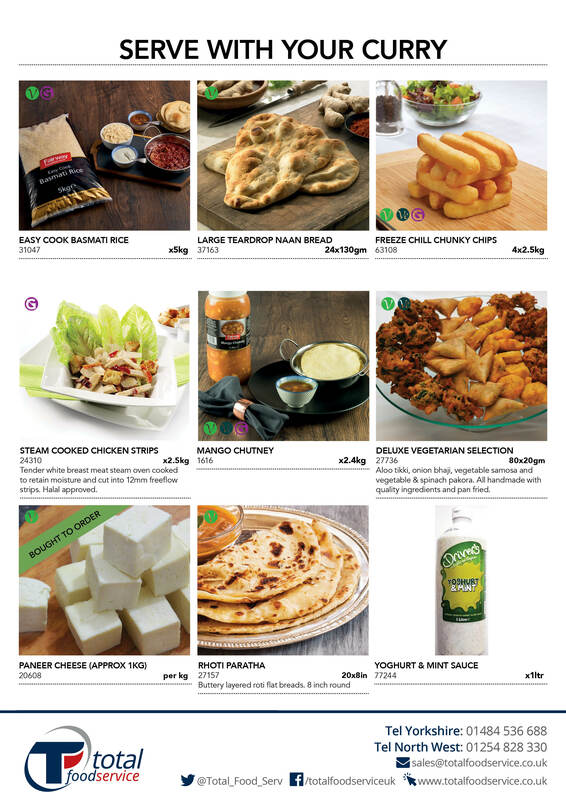 We love curries and our favourites are Chicken Tikka Masala – which apparently isn’t an authentic ethnic recipe at all! – and Lamb Rogan Josh – which is an Indian classic made with red chillies which give it spicy heat and its traditional red colour. Starting with the milder ones, Dhansak, made with slow-cooked meat and lentils with cumin and ginger, combines elements of Persian and Gujarati cuisine to create a slightly sweet and sour curry. It’s a great introduction to curry for those who prefer something lightly spiced. For those who always choose Tikka Masala, we suggest a Chicken Makhani, sometimes referred to as Butter Chicken as its fresh tomato base is enhanced with cream and butter and subtle spices. Moving onto something with a bit more punch, Jalfrezi was originally made from left-over ingredients, stir-fried with onions, chilli and spices. It works well with chicken or prawns. Asian cuisine, particularly Biryanis and Baltis, lends itself perfectly to a vegetarian diet. Perfect meat replacements that work really well in curries include cauliflower, aubergine, mushrooms, potatoes, peas and celery. Nuts, such as cashews and peanuts, will add crunch. For the full delicious experience, any curry must be complemented by a whole range of accompaniments – poppadoms and pickles, samosas and bhajis, different rices, naans, chapatis. We could go on! 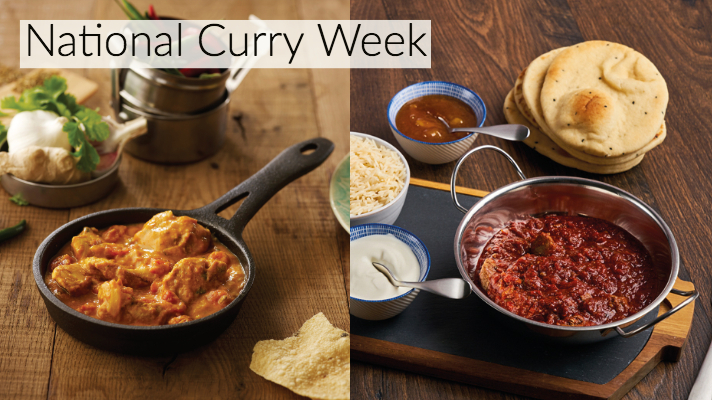 National Curry Week offers you the perfect excuse to introduce new dishes to your menus. 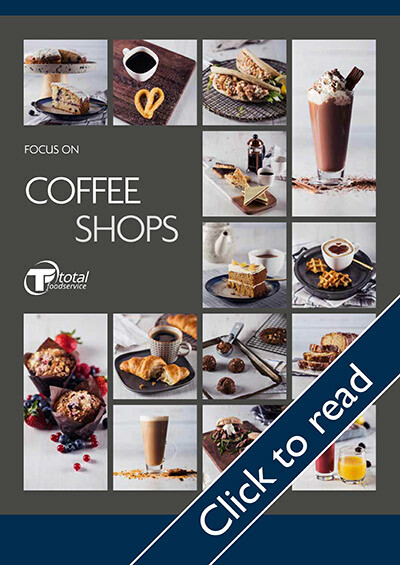 To make life easier, the Total Foodservice team has created a whole category of sauces and accompaniments, so you can offer your customers a different ethnic dish for each of the 7 days. Find them here. Don’t forget to share your triumphs on twitter with #NationalCurryWeek. We look forward to seeing what you’ve come up with! 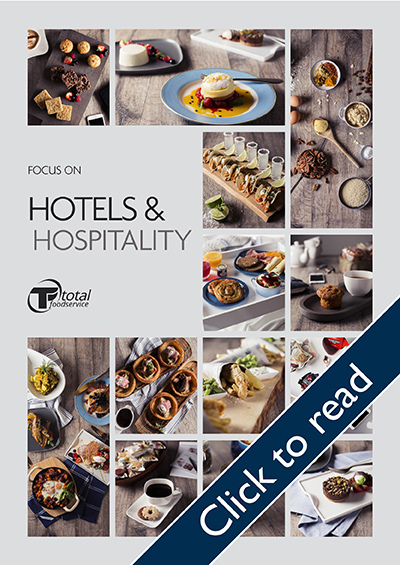 By clicking on submit you are granting Total Foodservice permission to contact you using the details supplied to inform you of special offers and news which may be of interest to you. If you do not wish to receive this information by the methods below please tick all that apply. You can also unsubscribe at any time in the future. We will reply to you in the next 2 working days.